ANDINAY is a band that features musicians with roots in Ecuador, Bolivia, and Peru. 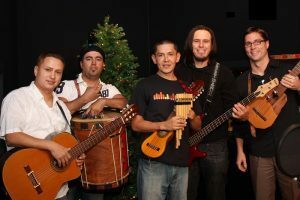 Their original compositions are performed on traditional instruments of their homelands including zamponas, quenas, charango, strings, and drums. Join us for this performance on Sunday, February 10, 2:00 pm at Mahopac Public Library. Registration is requested; register online at www.mahopaclibrary.org, or call 845-628-2009, ext 100. BAMM LENDS A HAND: Attendees are invited to bring one non-perishable food item to this performance. All of the collected items are donated to a local food pantry to help our community members in need.